I have often said and written, “Nothing is impossible for God!” Actually, there are a number of things that are impossible for Him. If you are curious or think I’ve fallen off the rails, read on! Discover what God will never do. I am so enthralled by the wonder and majesty of all God is and the glory of His splendor, I have never seriously thought about the things He will never do. Until now! I think of Joseph’s fifteen year journey through rejection, slavery, and imprisonment. Surely this was a horrific mistake! God had given him prophetic dreams of becoming a powerful leader. It may be difficult to clearly see, but God’s plans for you are always good. Always! We change clothes, houses, cars, workplaces, hairstyles and shoes. Quickly and often, we change our minds. Because we live in constant transition, it is difficult to believe God never changes. from God above, who created all heaven’s lights. It may be scary but let’s consider the thoughts we think. My list would include, pride, judgment, rebellion, and discouragement. Add to that self-righteousness, self-pity, self-promotion, self-sufficiency… Maybe we should stop there! No wonder the bible advises us to take our thoughts captive! Every thought of God originates in His loving, gracious and excellent nature. His thoughts towards us are beyond number and profoundly wonderful. What is more, God never has a better idea than His first one. His thoughts are completely flawless. 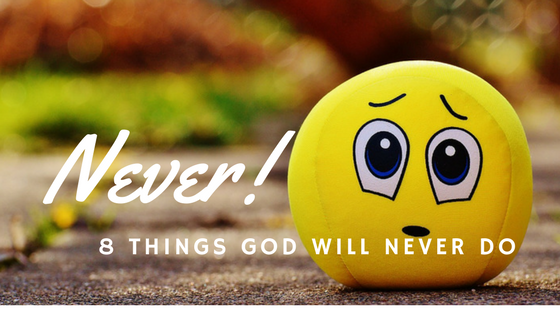 God never thinks a negative thought! I think He is trying to tell us something. Nothing can separate us from His great love. Be thoroughly convinced, nothing can separate us from God’s unfailing love. nor leave you without support. nor forsake nor let you down, nor relax my hold on you. I am not desperately holding unto His hand; He has a relentless grip on mine. He has no intentions of letting go. Assuredly not! There are over 5400 promises in the bible. Most are conditional; none have failed! What God has spoken, He will do. The bible overflows with the promises of God. They are guaranteed promises, we can stand on. The word “watches”, means “to watch and to keep.” Day and night, in good times and bad, God is constantly watching over and protecting us. Six times in eight verses, He confirms it. No matter what is going on in our lives, we can rest. God is awake and alert. We can rest our full weight on Him! Even on restless night, we need not fear, for God’s ear is open. God has us covered! He is watchful eye is on us. I rest upon His strength. Kings may oppose Him, rulers may defy Him, but no army will defeat Him or border stop Him. God holds the “all”: all authority, all power, all might, all wisdom, all strength, all glory, all dominion. Whenever the devil tries to get the upper hand, God reveals Himself and triumphs over all. Nothing can or will ever outdo the cross of Christ. never worries! He is never late! Although I wish His timing was more in tune with mine; a little early would be nice. Given some thought, you will easily add to this list of God’s “nevers”. He functions in complete alignment with his holy and perfect nature. Never contradicting who He is. I’m growing to love the never aspects of God’s character. As a matter of fact, I find deep assurance and confidence in pondering His “nevers”. He remains consistently and fully trustworthy. Creating a Culture of Honour – Honour God! Honour All! ← Something Better! God is Faithful to All He has Promised!